Make your dream come true and try paragliding in Tenerife with our team of advance paragliders. Have you always dreamed of caressing the clouds and unfolding your wings as if you were a bird? We offer you the best next thing, an experience very close to fulfilling your dream: tandem paragliding in Tenerife. Enjoy a tandem paragliding experience which takes off from 700m, contemplate the natural beauty of Tenerife while you fly with our expert instructors. Be amazed by beautiful panoramic views of the south of the island, where you can appreciate the sea, mountains and ravines all at once. If you like heights and nature, you’ll find with us different paragliding experiences we offer as Performance Flight or Izaña’s Flight that combines much more emotions like this one. What is paragliding? Paragliding is the closest feeling that people can get of flying like a bird. This sport consists of gliding with the only help of the wind, thermal currents and expertise of the instructor who pilot the glider. 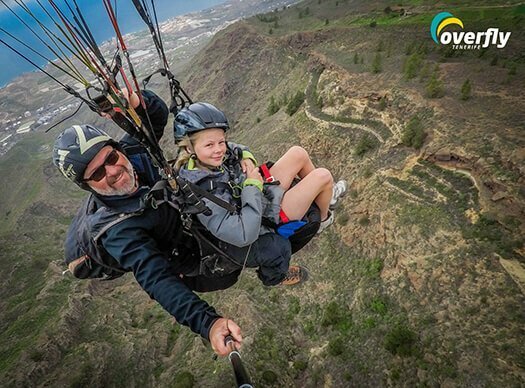 Tandem paragliding in Tenerife is a great option to make your dream come true: discover the magic of free flight, enjoy this beautiful landscape from an incredible and new point of view and feel that feeling of floating inside the sky as if it were a bird. You will achieve this from the hand of our tandem pilots, who are experienced doing flights for beginners, so you don’t have to learn paraglide. You’ll receive paragliding briefing instructions before your feet take off the ground. This way our instructors will equip you with a harness and helmet and explain the take-off procedure. You will be informed at all times so that you have a wonderful experience. We will provide you with all the paragliding equipment you will need for your flight, so there’s no need to find a paragliding shop before you meet us. Choose tandem paragliding in Tenerife for your holidays and we guarantee you’ll have the time of your life. Enjoy a privileged view of the island and the amazing feeling of flying in the sky. The takeoff is located 700m high, our instructors will equip you with a harness and helmet and explain the takeoff procedure. You will be informed at all times so that you have a wonderful experience. Once you have taken off, sit back and relax as you find yourself comfortably seated in a safe harness. The pilot will be able to show you the different views that can be seen from this flight, such as the Barranco del Infierno or the Tejina mountain. Beginner. It will be very easy, follow the instructions of your instructor and you will be flying in an instant! The duration of the flight is between 15 and 20 minutes but you will need 2 hours in total for the whole experience including transportation. We can collect you from your hotel if you are staying in the south of the island or, if you prefer, you can come to the meeting point at Enramada beach, Costa Adeje. In addition to enjoying the views and letting yourself be caressed by the wind, you can ask your instructor to allow you to take a turn and enjoy first hand piloting this glider. The landing place is decided the same day the flight is made, since we depend on the climatic conditions for the election of the same. In order to comply with the homologation of the glider, the weight of the passenger may not exceed 100kg. The minimum age to fly is 6 years. Children under 18 must be accompanied by a guardian. Is not allowed to carry anything in your hands as a phone or video camera and photos. What's included & what's not? All homologated safety equipment, harness and helmet.